IGIS Developed "Wild Pig App" in the news! IGIS is in the news for the development and release of the Wild Pig Damage App! The app was recently higlighted by Julia Mitric, Food And Sustainability Reporter with Capital Public Radio. Description of the App: The UC ANR's University of California Cooperative Extension and Informatics and GIS Program have developed a GIS-based mobile application for Apple and Android devices that will collect wild pig damage on range, forest and agricultural lands over time. By taking at least three locations the app will map acreage and geographic location of wild pig damage reported by the users. Cell service at the site is not required to collect data. The data will be uploaded to a UC ANR server for use by the UC advisors and the specialist that created the app so they may analyze and report data at a county, region, state, national or international level. Private property and user identities are blocked from the general public to maintain the privacy of the users. Public land managers can also use the app. The first efforts are focused on California. Potential users include ranchers, farmers, forest land owners, managers, and agency personnel such as UCCE Advisors, NRCS, Wildlife Services, etc. In addition, citizen scientists could also report damage on public lands or on private lands if they have access permission by the land owner. 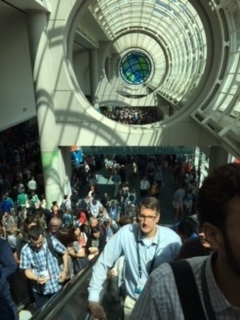 Day 2 of the ESRI User Conference, for those who have not been to the user conference is an informative yet tiring event. Today I had the opportunity to get quick and helpful answers to some issues I have been struggling with in my programming within IGIS. With the technical support, I look forward to releasing an app we have been developing with Researchers within UCANR. Beyond getting some technical support questions answered, I have seen new tools that are going to be released in the coming months to analyze big data. I have seen new ways to visualize and display real-time data, such as streaming feeds from our UCANR Flux Network. I have also seen new data collection apps that we will be able to use to get citizen involvement in the collection of data to extend our research within UCANR. I look forward to seeing new tools that we might be able to UCANR in the coming months. What a day… The first day at the conference was exciting and a little overwhelming as always. 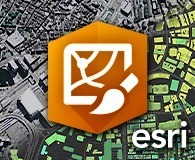 This year ESRI is talking about the ArcGIS suite with particular focus on ArcGIS Pro, ArcGIS Online, and 3D Data and its integration into the ArcGIS Suite of software. I am looking forward to gaining more knowledge about the new technologies and tools that ESRI will be unveiling over the coming days and thinking about we at UCANR can benefit from these technologies. Stay tuned for more details in the coming days!